Center of Gravity weaves a chilling tale, revealing the unfailing and dangerous truth that things—and people—are not always what they seem. Before he was born, other moms always shared stories about the fierce love that surges in a woman the moment she gazes on her newborn's face. How childbirth paid disappears, replaced by an intense need to care for and protect this amazing creature at all costs. It's so true: no one mentioned it could happen the other way around. The same bond can form--just as deeply, just as strong--when a child without a mother finds you first. People tell you that marriage and motherhood are the hardest job in the world. Naïve me, I didn't believe it. Lesson learned: Monsters don't have to be green or crazy with gnashing teeth. They look like regular people. What's different --what makes them mean or bad--is on the inside. A few years ago, Ava and Mitchell fell in love. They got married and Ava got a ready made family with an eight year old boy Jack that she fell in love with and treats like her own and a new baby that is just a year old. Ava thought her life was complete, perfect in fact. Mitchell is a success in his work and dotes on Ava so lovingly. What could possibly go wrong? Just like that, Mitchell changes into this man that Ava no longer knows. They have a small disagreement, at least in Ava's opinion, and Mitchell files for divorce. Then another bomb drops that he is seeking full custody of the two boys. Ava is beside herself but still can't get herself to believe that Mitchell won't change back into the wonderful man she married. Her lawyer tries to convince her that they need to start playing hard ball but Ava just can't do it. What will Mitchell do to Ava's perfect picture life to make her finally realize, it's time to join in on the war that Mitchell is fighting? This book was suspenseful, sweet, funny, and endearing. The author weaves the story just right where the reader is literally speed reading to find out what happens in the next sentence, the next chapter and finally the ending. WOW! This is one of the best told suspense novels I've read this year! What a well crafted, multi-layered plot "Center of Gravity" ends up being. It explores the ways in which we can get swept up in the day to day life of our loved ones but not really know them at all. Center of Gravity is an engrossing story of trust, family loyalty, and the deep dark secrets people bury. I am so happy to recommend this mind blowing suspense novel to all the readers out there looking for their next can't-put-it down read. Laura adores hot coffee, good manners, the color pink, and novels that keep her reading past midnight. She believes in the beauty of words, paying it forward, and that nerds rule the world. Laura is a fan of balmy summer nights, fireflies, and pristine mountain lakes. She lives in Mobile, Alabama with her two sons. 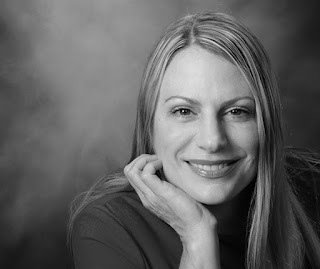 You can find Laura Tweeting @Lauramcneillbks and blogging at lauramcneill.com. 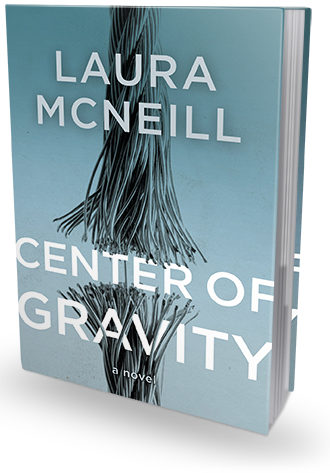 After July 14th, Laura’s suspense novel, Center of Gravity, can be found wherever fine books are sold.